Apart from beautiful fields, adventurous rivers, and great food, Texas Hill Country is also known for its excellent wineries. More than five million annual visitors visit the over 50 unique and spectacular wineries scattered from Austin to Fredericksburg and Lampasas to New Braunfels. Each winery in New Braunfels has its own characteristics in terms of style, personality, and setting, however, they all share the same distinct charm of hospitality and passion. The wineries range from large estates to medium-sized operations and small boutiques. These wineries are great not just for their unparalleled wine, but also for those perfect Instagram-worthy pictures. Many of the boutique size wineries located in downtown also exhibit German characteristics with boxed architecture. Bending Branch Winery – This winery sits on 56 scenic acres near the Guadalupe River outside of Comfort. Established in 2009, they possess many award-winning wines such as Cabernet Sauvignon, Charbono, as well as their signature grape, Tannat, which is a true champion of Texas terroir. You can also enjoy live music every Saturday in this winery which is also the winner of the 2018 Houston Rodeo Uncorked! International Wine Competition. Bent Oak Winery – Located just west of Austin in Cedar Park, Texas, Bent Oak Winery is one of the finest wineries that New Braunfels has to offer. A family-run operation, the grapes are grown in their backyard vineyard, hand-picked, and sorted with the utmost care to preserve their essence. Bending Branch – A winery established in 2009, the Bending Branch Winery is located in the heart of the historic downtown area of New Braunfels. A family business, the winery offers much more than traditional wine tastings in their chic tasting room. It also has an elegant, private event room which caters to events, such as wine socials, bridal or baby showers, and/or business meetings. Dry Comal Creek Winery and Vineyards – Franklin Houser, a former San Antonio attorney purchased a house, set on 103 acres in the 1970’s. Over a glass of Sangria, Mr. Houser retired from making wines and sold his winery to Raphael Romero Sr., a first-generation Mexican immigrant who spent his summers on a family farm learning English and fruit farming. Apart from great wine, amazing service, and 100% Texas fruits, the Dry Comal is also home to the unique “Black Spanish” grape. Kerrville Hills Winery – The spacious tasting room at Kerrville Hills Winery is located on a hill high above Kerrville, overlooking the Guadalupe River Valley. It still includes the original home’s double-sided fireplace, unique rustic warehouse décor, and a view of the winery production areas. In addition to wine tasting, the winery also hosts fun events such as painting parties, wine & yoga, live music, food trucks, and more. 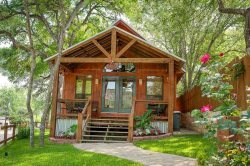 Next time you’re thinking of visiting Texas, do consider New Braunfels if you enjoy history, fun river sports such as tubing, and also have a passion for wine and food; there is just so much to do, see and explore!